how to export SharePoint subsite? export subsite SharePoint 2013 PowerShell, Unlike SharePoint 2013, you'll have to create a subsite first and then import. Export-SPWeb cmdlet used to export a sub site, list or document library. Open SharePoint 2013 Management Shell and run this command. Change Site URL and Path values accordingly. 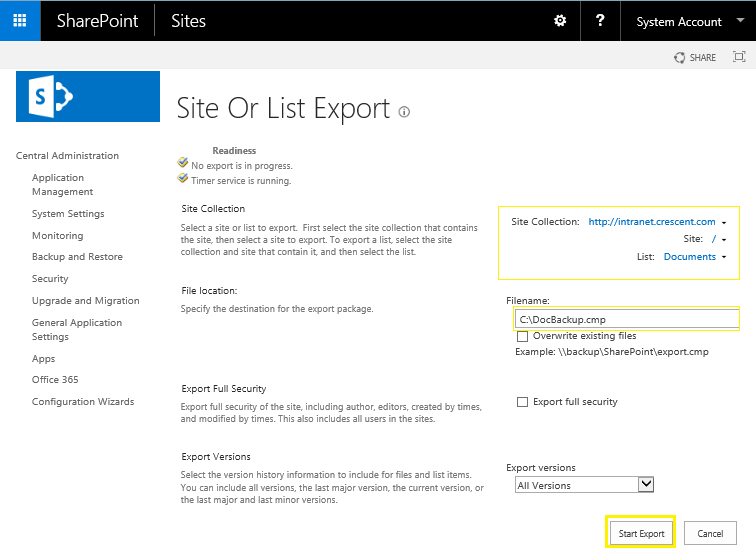 You can also export a Subsite from SharePoint 2010/2013/2016 Central Administration via "Export a site or list" capability. Go to SharePoint Central Administration >> Backup and Restore >> Click on "Export a site or list" link under "Granular Backup" group. Important: Both the source and destination sites should be using same template! Import-SPWeb PowerShell cmdlet used to import a sub site from backup. With these cmdlets, we can Export and Import a particular sub site, list or document library. You can also use Export-SPWeb & Import-SPWeb cmdlets to copy list with data between SharePoint Sites/Web Apps/or between different environments. E.g. Copy a SharePoint list from Dev to Staging server. Created By, Modified By details, etc.